Reason for inclusion: This is considered one of the greatest thrillers ever made. I had also never seen a film by Henri-Georges Clouzot. Somewhere deep in rural South America, the impoverished town of Las Piedras has become something of a final destination for many foreign drifters and washed-up laborers. The nearby American oil corporation, Standard Oil, essentially controls the town and the surrounding area, providing the main source of income for most of the townfolk. The corporation’s practices are hardly ethical, and it’s common to hear of explosions and other horrific accidents on the oil fields. Given their reckless work environment, it’s no surprise that Standard Oil would send a man to Las Piedras to recruit four desperate civilians to perform an incredibly dangerous — and possibly suicidal — task. The request? Drive two large trucks filled with highly volatile nitroglycerine over 300 miles across some of the continent’s worst terrain. One mere bump could set off a fatal explosion. Unsurprisingly, given the extreme poverty in Las Piedras, it doesn’t take long for some men to take up the offer. A combination of pride, machismo, and the $2000 price point prompts four men to embark on the treacherous journey. 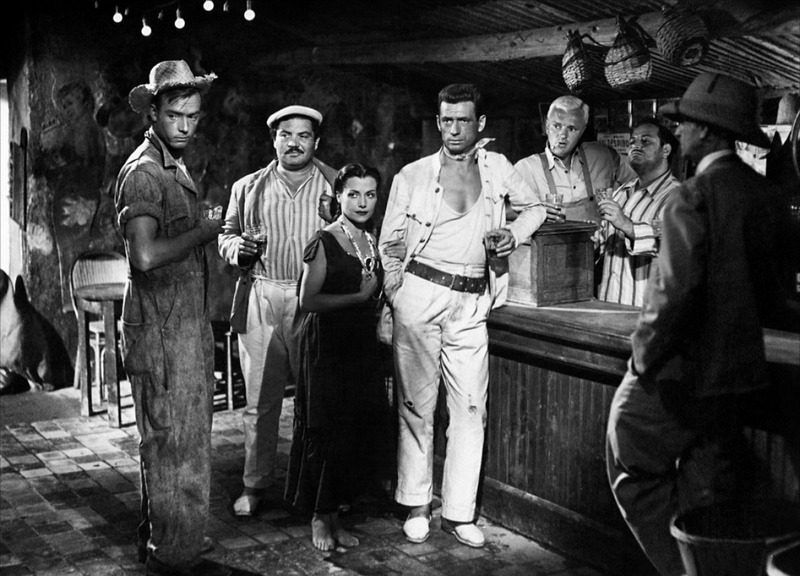 Mario (Yves Montand), Jo (Charles Vanel), Bimba (Peter van Eyck) and Luigi (Folco Lulli) are these brave men, all four of whom are ex-pats looking for a way out of town. They pair up, two per truck, alternating turns driving across bumpy dirt roads, unstable bridges, and rocky mountain passes. 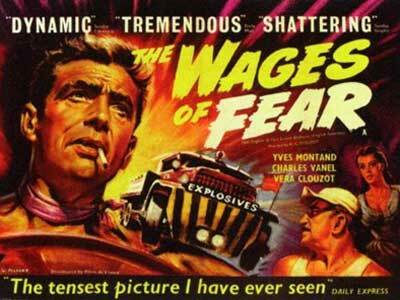 The Wages of Fear is essentially split into two halves. The first hour or so is methodically paced, as it introduces the main characters and shares a bit of their back stories. At the same time, it does grow somewhat tedious, as unimportant characters are given too much screen time, and it’s never quite clear *why* these European ex-pats ended up in this particular town. However, when the actual driving begins, the film really kicks into high gear. There is an overwhelming sense of dread throughout their journey, as the men’s courage is constantly put to the test. There are many, many moments where it seems like the end is near for them. For example, one stretch of the road — dubbed “the washboard” — is especially rough, consisting of nothing but bump after perilous bump. In order to traverse through this area, they have to keep their foot on the gas, maintaining a high speed until they reach the end. It’s an unbelievably tense moment, especially as they had made it a point until then to drive very slowly. 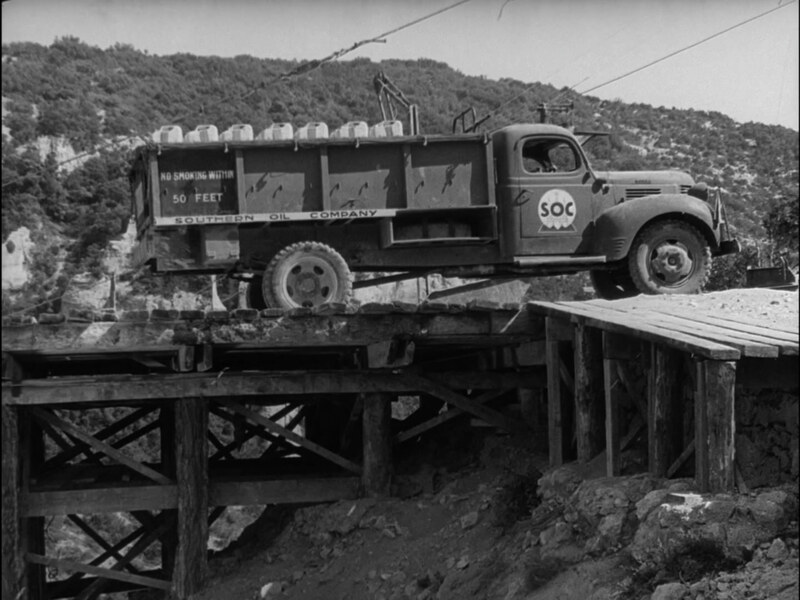 An even tenser scene — and arguably the film’s most famous — has the men trying to navigate a hairpin bend in the mountains in order to get around construction. The only way to do so requires them to back up on an unstable wooden platform, where one crack would send them flying off the cliff to certain death. The Wages of Fear is filled with suspenseful moments such as these, and it truly earns its status as one of the all-time great thrillers. This is a film that will keep you on the edge of your seat throughout, and given its French/Italian origin, there is simply no guarantee that there will be a happy ending, adding even more to its effectiveness. Although the film takes some time to get going, it more than makes up for it in its white-knuckle second half. Have you seen William Friedkin’s wonderful, but underrated, American remake of this? Sorcerer. It’s well-worth the screening, if you can catch it at a revival theater. The current DVD is not worth watching as it’s barebones and cropped badly. Wait for this in 2014. Fine look at another classic, Eric. No, I haven’t seen Sorcerer, but you’ve definitely piqued my interest. I’ll keep an eye out for any possible screenings around here. Thanks, Michael! 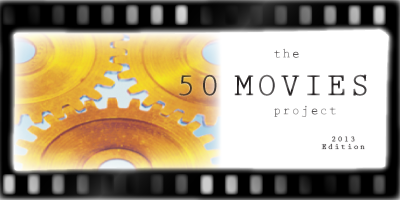 Well laid out and executed critique of a film that defines “No Slack” sweatily and suspensefully! To the point where you forget why the men took on the contract, but marvel as each seeks his own, often waylaid road to redemption. Thanks, Jack! I got a kick out of Jo’s character arc in particular — he had nerves of steel before they left, but once he hit the road, he was a quivering mess. Kudos to him for at least getting out of town though. I know I couldn’t do it.